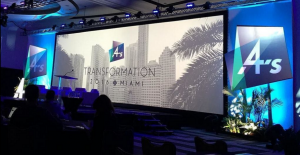 The flagship event of the American Association of Advertising Agencies, Transformation 2016, is finally here. We had the privilege of joining top agencies in beautiful Miami, and what we’re heard was challenging, disruptive, and exciting. “Say No To Spec” is a video that opened Tuesday’s festivities. Why is it that the advertising industry has accepted the standard of giving away work for free? Estimates say that the industry gave away $400 million in intellectual property last year, and over 4 million hours of real work. #SayNoToSpec! Inefficiencies and redundancies? We know a thing or two about that– our whole mission is to change the way media is bought and sold, and eliminating inefficiencies is a central focus of everything we do. Wendy Clark at DDB nailed it here. The currency of business is speed, and the advertising industry is no exception. Talent acquisition and retention is a major pain point among agencies right now. The general consensus is that it’s a morale problem. Advertising has always been a shining beacon or creative expression for fresh, young talent, and it still is. The issue that’s arising is retention, especially among millennials. Perceived progress is important to millennials. Unfortunately, many of them perceive a clear line between the underlings doing the grunt work, and the creatives and dreamers one floor above them. These employees are talented and understand the concept of paying their dues. But, when they can’t see a path ahead of them, they get restless. According to Marie-Claire Barker, millennials want more than just free food and happy hour, they want experience and fulfillment. Diversity was a huge topic at Transformation this year. The industry is suffering a dearth of gender, race, religion and age diversity, and people are taking notice. Moreover, it’s affecting work. The Latino population has $1.5 trillion in spending power, but is largely ignored, partially because it’s not understood. Diversity isn’t just a requirement for political correctness, it’s a business advantage. The (hilarious) sentiment here is that either by a company or by time, everybody will be fired eventually. So create like there’s no tomorrow! Your comfort zone is killing you. Not just on a macro-level– creativity stems from training your brain to think outside of its normal routine. An agency’s clients, audiences, and talent deserve great creative, and now is the time to deliver that.